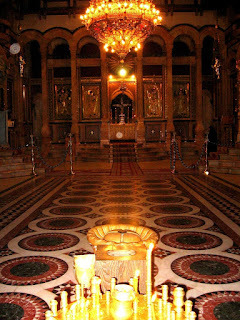 In the church of the Holy Sepulcher, in Jerusalem, in the main part of the Catholikon, the Greek Orthodox main church, there is a strange vase looking thing about three feet high called the “ omphalos.” Omphalos is the Greek word for navel, or belly button, for those who think navel has to do with ships. It is claimed that here lies the very center of the world. I once read in a guide book that to claim to be the center of the world is a statement that is at all points true, the world being a sphere. I wish I could tell you what the omphalos in Jerusalem is and whence it comes, but I cannot. Perhaps it is an old lawn ornament about which someone once said, “Oh, put it over there until we figure out what to do with it.” That is a very foolish thing to say. Once something is located in the church of the Holy Sepulcher it becomes very important and to move it takes negotiations with 5 major religious groups and the Israeli government. There is a ladder leaning up against a window on the ledge over the main entrance to the church. It is called the immovable ladder. No one knows how it got there or when, but heaven forefend that it should be moved now. A few years back someone unknown moved it to the other end of the ledge, causing an international and inter-religious crisis that was resolved only when the ladder had been moved back to its original place of uselessness. It is there still, serving no actual purpose. There is a moral here, but I’m not sure what it is. Anyway, the navel of the world is definitely right where it has been as long as I can remember. Though many places claim to be the center of the world, this particular center of the world has a good claim to the name. Until Christopher Columbus or the Basques or the space aliens discovered the Americas, the Holy Land was the land bridge where Africa, Asia and Europe met. If you wanted to invade your neighbor, the Holy Land was right on your path. The Assyrians invaded Egypt, the Hittites invaded Egypt, the Egyptians, indeed the Hittites and Alexander the Great invaded everybody all by tromping through the Holy Land, much to the chagrin and inconvenience of the locals. In fact, the geography of the country is a sort of invasion. The African tectonic plate is pushing up into Europe. The Arabian tectonic plate is pushing over into Africa, or something like that. The result is that Jerusalem is a city in the hills 2,500 feet above sea level. Go due east almost 15 miles and down 3,400 feet and you come to Jericho and a little further to the Dead Sea which is 1,400 feet below sea level. It is the lowest place on the face of the earth, hot as blazes and dry as a bone. The Sea of Galilee is the lowest fresh water lake in the world and is about 700 feet below sea level. It is lush and green and tropical, abundant with life. The Jordan River flows out of the Sea of Galilee into the Dead Sea where its waters evaporate leaving nothing behind but salt and wasteland. Go straight up 3,400 feet through fifteen miles of desert and you come to the Judean hills, and you cross over them into the basin of the Mediterranean Sea and suddenly it is wet and green and rich. The Judean hills are pushed up right down in the middle of the land, separating brown and rocky desert from green farms. On the crest of this ridge of steep hills sits Jerusalem like a crown. In the far north, these hills turn into real mountains beginning with snow-capped Mt. Hermon at almost 10,000 feet. All these deserts, salt flat mountains, invading armies, religious prophets and millennia of history, are in a place not much larger than a good sized metropolitan area in the USA. From Mt. Hermon in the far North to Beersheba on the edge of the southern desert is only 200 miles. From Jerusalem to Capernaum is only about 80 miles and this in a county that is no more than fifty miles wide. The Holy Land, packed with history and faith is tiny. The “Sea” of Galilee is a moderate sized lake, 13 miles long and 8 miles wide. It too is about 700 feet below sea level. On the northwest corner of the Sea of Galilee perches the Gospel Triangle formed by three towns where Jesus did most of his preaching and healing, Capernaum to Korazin to Bethsaida two miles by four miles by five miles as the crow flies, more or less. Once upon a time, the Creator of the universe, the Being who is the source of being, fixed His gaze on this little galaxy, on a little star at the edge of this little galaxy, and a speck of dust spinning around that little star, on a little town called “Little Shoot” (Nazareth in Hebrew) in a troubled little country. He fixed His gaze on a little girl from a poor family and “the Word Became Flesh and Dwelt Among Us, all in a little place that really was the center of the world.